Almighty God says, "The incarnate God is called Christ, and Christ is the flesh donned by the Spirit of God. This flesh is unlike any man that is of the flesh. This difference is because Christ is not of flesh and blood but is the incarnation of the Spirit. He has both a normal humanity and a complete divinity. His divinity is not possessed by any man. His normal humanity sustains all His normal activities in the flesh, while His divinity carries out the work of God Himself. 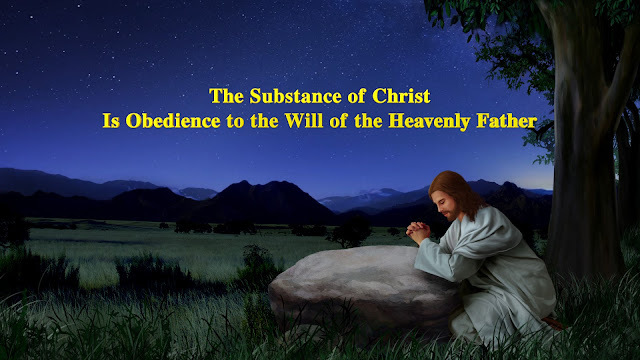 Be it His humanity or divinity, both submit to the will of the heavenly Father. The substance of Christ is the Spirit, that is, the divinity. Therefore, His substance is that of God Himself; this substance will not interrupt His own work, and He could not possibly do anything that destroys His own work, nor would He ever utter any words that go against His own will. Therefore, the incarnate God would absolutely never do any work that interrupts His own management. This is what all man should understand. The essence of the work of the Holy Spirit is to save man and is for the sake of God’s own management. Similarly, the work of Christ is to save man and is for the sake of God’s will. Given that God becomes flesh, He realizes His substance within His flesh, such that His flesh is sufficient to undertake His work. Therefore, all the work of God’s Spirit is replaced by the work of Christ during the time of incarnation, and at the core of all work throughout the time of incarnation is the work of Christ. It cannot be commingled with work from any other age. And since God becomes flesh, He works in the identity of His flesh; since He comes in the flesh, He then finishes in the flesh the work that He ought to do. Be it the Spirit of God or be it Christ, both are God Himself, and He does the work that He ought to do and performs the ministry that He ought to perform."